The town of Forest Green has returned to normal. A forced normalcy, yes; one that has caused the name of the once-notorious community of Crystal Lake to be changed to its current identity of Forest Green, but normal nonetheless. Shopkeepers sell their wares, schoolteachers expound on the mysteries of life, children p-lay their childhood games. Life goes on, and few try to remember the ghastly series of events which focused the attention of the entire nation on this small East Coast community. The seemingly unstoppable force that was Jason has been snuffed out forever; just as the demonic Jason had snuffed out the lives of scores of victims in a bloody rampage through this unremarkable community. The adults who mourned the loss of their children and friends no longer speak of Jason. To the children now playing in the streets and whispering around campfires, Jason Voorhees is but a legend. A bogeyman. boy with more courage than most men, killed him. Grown now, Tommy (THOM MATHEWS) is haunted by the memories of his boyhood encounter with the maniacal killer who slaughtered his friends. Determined to rid himself of the anguish of these memories, Tommy returns to the former town of Crystal Lake to see, with his own eyes, the grave of Jason Vorhees. He will exhume the body and know once and for all that the killer in the goalie mask rots in the earth. Kagen. 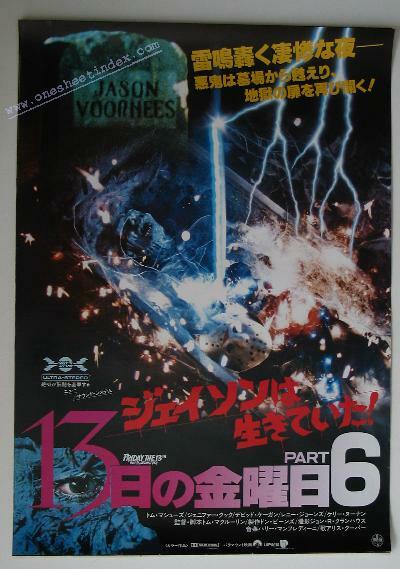 Written and directed by Tom McLoughlin, "Friday the 13th, Part VI: Jason Lives" was produced by Don Behrns. The music for the film was composed by Harry Manfredini. In fashioning the screenplay for "Friday the 13th, Part VI: Jason Lives," screenwriter/director Tom McLoughlin set out to combine the elements which have made the "Friday the 13th" films so popular with a slightly off-kilter, more personal approach to the genre. McLoughlin has added other dimensions to the characters, most notably humor, and has structured the film more in the tradition of a classic Gothic horror story than today's standard mayhem-in-the-woods fare. The look of the film is a departure from others in the series as well; McLoughlin and cinematographer Jon Kranhouse opted to dispense with the standard "grainy" look of modern-day horror films for a slicker visual scheme utilizing hard back-light, vivid splashes of color and sweeping camera movements. "Friday the 13th, Part VI: Jason Lives" was filmed entirely on location in Covington, Georgia, a suburb of Atlanta chosen for its particularly verdant settings. (Previous "Friday the 13th" films were shot in Connecticut, New Jersey and southern California). With his cast assembled from sessions in Los Angeles, director McLoughlin arrived in Covington for two months of intensive filming, including five weeks of night shooting. McLoughlin's screenplay for "Friday the 13th, Part VI: Jason Lives" requires the production team to stage car chases, underwater scenes and sequences involving children. With principal photography completed, McLoughlin returned to Los Angeles for post-production. Harry Manfredini, who has composed the music for all the "Friday the 13th" films, contributed his trademark themes for the soundtrack of "Friday the 13th, Part VI: Jason Lives." Copyright © 1986 By Paramount Pictures Corporation.